In 2007, the International Panel on Climate Change wrote, in part, “we should recognise that we are dealing with a coupled nonlinear chaotic system, and therefore that the long-term prediction of future climate states is not possible.” Think about that statement for a bit, please. We came across that particular quote in an essay by one of the five identifiable founders of Greenpeace, Dr. Patrick Moore, Ph.D., found here. Moore extrapolates from this statement two important points. First, the fact that a coupled nonlinear chaotic system makes long-term prediction of future climate states impossible means that the ideas behind anthropogenic causes of global warming pose serious difficulties in making public policy. Public policies that are supposedly going to reduce greenhouse gas emissions and other sources of warming may or may not reduce warming in the future. Indeed, Moore indicates considerable evidence that there has been no statistically meaningful warming in the past 18 years, during which time about a third of all human-caused carbon dioxide emissions have taken place. Second, the fact that the International Panel on Climate Change has stated so clearly their understanding that they cannot predict future climate states over the long term means that they themselves know that their proposed policies are questionable. What they propose to do may or may not bring about the changes they seek, and they cannot possibly predict future climate states over the long term. Here, in essence, is the hubris of the entire concept of scientific socialism. It is, after all, not only the global climate which is a coupled nonlinear chaotic system, but many other aspects of life. The global economy is a coupled nonlinear chaotic system. Let’s parse that phrase just a bit, first, and then examine what it means in practice. A coupled nonlinear chaotic system would be distinct from an uncoupled, linear, ordered system. So let’s examine what each of these terms means. Edward Lorenz writes in his book “The Essence of Chaos” that a linear system is one in which alterations of an initial state will result in proportional alterations in any subsequent state. You could map a linear system in two dimensions by writing an equation for a line that represents the system. For example, the equation 2x = y describes a line among points such as (1, 2) (2, 4) (4, 8) where the first value in each case is the location along the x-axis and the second value is the location along the y-axis. You can see immediately that each of the y values is twice as big as the corresponding x value. You have a straight line, proceeding from (0,0), the origin, up and to the right in the first quadrant of a Cartesian coordinate system. The equation also works with negative numbers, so the same line proceeds down and to the left from the origin, at the same angle. Linear. In a straight line. You might take an example from cooking. If you have a recipe for chocolate chip cookies and you buy two packages of chocolate chips you can double the ingredients and the recipe will probably turn out okay. However, in institutional cooking, one learns that some things do not scale indefinitely. If you take a recipe that works well for making a meal for four people and multiply all the ingredients by 100, you do not get a meal for 400 people, you get a huge mess. Chemistry can be non-linear. So is life. Consider, for example, a simple harmonic oscillator. You can write the equation for that simple oscillation as the equation of a line. But when you examine the true equation for the motions of a pendulum, you find that it has significant non-linearity. There are aspects of the behaviour of the pendulum that can be modelled using a linear equation, but doing so requires that you artificially discard aspects of its true behaviour from the model. You can think, if you wish, of linear approximations of complex systems as analogies. By making an analogy from the complex to the simple, and using the mathematics you understand to examine what you know about the simple, you can imagine that the complex system is somewhat better understood. But, in reality, you are engaged in wishful thinking. The saying “life is like a box of chocolates” is a simile, making an analogy between the box of chocolates and a person’s life. With respect to the idea that “you never know what you’ll get,” as Forrest Gump was fond of saying, the analogy holds true. However, life is not chocolate coated, is best lived outside boxes, and has all kinds of features that are not modelled by the analogy. So the general statement about reality is that it is nonlinear. A nonlinear system is one in which alterations of an initial state need not produce proportional alterations in any subsequent states. You might find a partial differential equation that approximates a nonlinear system, but there are certainly systems which are not effectively modelled by any single equation. Coupling occurs when two or more systems that are themselves chaotic are synchronised by a coupling factor. One sees the exponential divergence which occurs in nearby trajectories of chaotic systems and finds the idea of chaotic systems evolving synchronously to be surprising, but it seems to occur quite often. Coupling, however, is not necessarily a permanent feature, and over the course of time, synchronised chaotic systems can become uncoupled for a time, and also re-couple later on. So, then, what of chaos generally? Let’s turn again to Lorenz: Chaos may be described as when the present determines the future, but the approximate present does not approximately determine the future. Very tiny alterations in initial conditions can dramatically alter outcomes, so that what appears to be an identical set of initial conditions but is only approximately identical can result in vastly different final conditions. Chaotic behavior exists in essentially all natural systems, such as weather, climate, living systems, and economies. We can certainly study the behaviour of chaotic systems. Mathematical models have been constructed which can be useful in such studies. There are also analytical tools like recurrence plots and Poincaré maps. What we cannot do, what the mathematics says very clearly we cannot do, is make long term predictions of the outcomes of policies. We not only do not know, we cannot know, how changes in conditions starting today will turn out in, say, fifty or one hundred years. We can make plans, we can set guidelines, and we can affect the world around us, but we cannot be confident that the long term results we seek are going to be obtained. Are we better off, individually or collectively, if human activities are planned, constrained, and limited by a central planning operation? Leave aside whether that central planning group is elected or self-chosen, whether it is a dictatorship of the people or a dictatorship of some one person, whether it embraces input from divers sources or whether it only cares about official measurements, would we get better results from people free to choose their own courses of action, free to discover market clearing prices without censorship or imposition, or would we get better results from having all choices first evaluated by a committee, or a dictator? The answer is very clear. We cannot get good results from central planning. We also know that the central planners are able to evaluate their own mathematics, and they know that they cannot provide good results. We also know that their position as central planners is used to their advantage and to the advantage of those who pay them off with bribes, campaign contributions, and lobbying activities. We know that the system is broken and unable to manage our lives better than we ourselves can manage on our own. The people running the system know those facts, too. 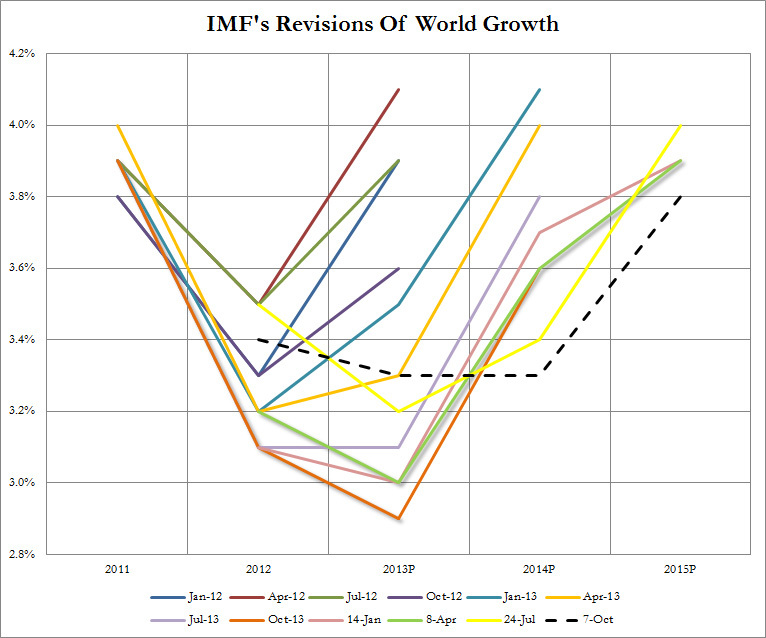 Here, for example, are the forecasts of the International Monetary Fund about global growth, something you would think they would study carefully. 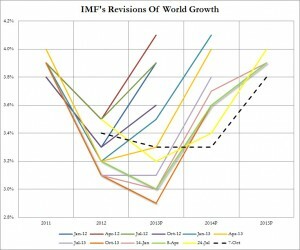 Try to imagine, while looking at this chart of how they predicted world economic growth would proceed, that you are looking at a time series of sincere predictions, rather than a random set of lines. They continue to pretend to produce good results through central planning because it benefits them and their cronies for them to do so. But don’t be fooled. They certainly are not. How, then, should you choose to proceed? If central planners are engaged in fraud, if their plan for you and the economy is never going to work, what should you do? You should make your own plans for your own benefit. You are best suited to determine for yourself what is best for you. You don’t need the central planners, the Federal Reserve, the government, or any of their systems. Consider, for examples (these examples were used very wisely some two thousand years ago) the lilies of the field and the birds of the air which neither toil, nor spin. Nor do they pay taxes, nor do they read government reports, nor do they pay attention to laws. Yet they find everything they need. Agorism is a libertarian philosophical approach to making your life better as you see fit. It suggests that you use counter-economic tools, such as free market money, digital cash, virtual privacy networks, the underground economy, and that you reject mainstream society’s limitations, rules, regulations, and obligations. Take it a step further. Complex adaptive systems start out with about 3 simple initial conditions. So “poverty” is not a symptom, it’s a result. So trying to alleviate poverty at he level of manifestation takes a lot of resources, and only works while resources keep flowing because more “poverty” is always coming. Knowing this we can design and iterate things much more effectively. And critique! Simply ask people who are promoting conclusions about the wether, society, etc. what their 3 simple initial conditions are. 🙂 They won’t know 🙂 Another good question, “What is the percent error?” Most won’t know that either. When I can’t answer a simple question, I tend to shut up 🙂 Nassim Teleb recently had a nice comment illustrating fat tails and violence “trends”. https://dl.dropboxusercontent.com/u/50282823/commentpinkerbs.pdf It pays t know a bit of statistics and complexity theory! Yes, Jeff, it does. I remember a college course in statistics that was extremely beneficial to me in my ability to think and diagnose problems. It also helps to know advanced mathematics. The world is unpredictable, but it is not entirely mysterious.